Emerging markets are in a bull market. That’s not something we’ve been able to say for much of the past several years. In fact, it was quite the opposite story last year, when emerging market stocks had collapsed on a combination of a lower U.S. dollar, plunging commodity prices and fears of a China-led global growth stall. Well, since mid-January, emerging markets have staged a laudable rebound. 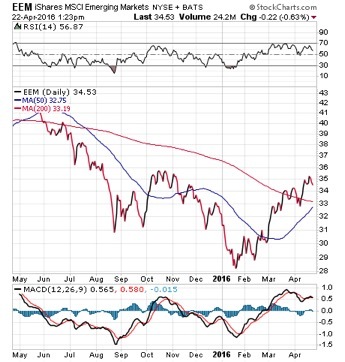 That rebound has been particularly robust over the past three months, as emerging markets exchange-traded fund (ETF) EEM has soared nearly 20% over that period. The chart below of EEM shows the raging bull surge in the segment, which has vaulted the fund’s shares well past the 200-day moving average to levels not seen since November. One driver of this emerging market bull is the rise of the U.S. dollar vs. rival foreign currencies. Perhaps more important is the rebound in commodity prices, which have really helped many emerging market countries, as many are commodity-producing nations. Then we have the rebound in China, which still is the biggest consumer of commodities. The shoring up of that country’s equity market and the still-slowing, but stabilizing economic picture there has given many investors the green light to get back into emerging markets. The charts here of the iShares China Large-Cap ETF (FXI), as well as the PowerShares DB Commodities Index Tracking Fund (DBC) tell the same tale of recent bullishness. 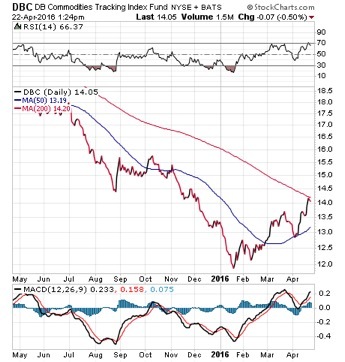 It is my opinion that the raging bull market in commodities is likely to continue, as the dollar gains strength, commodity prices seem to put in a bottom and China continues to improve its equity and economic metrics. 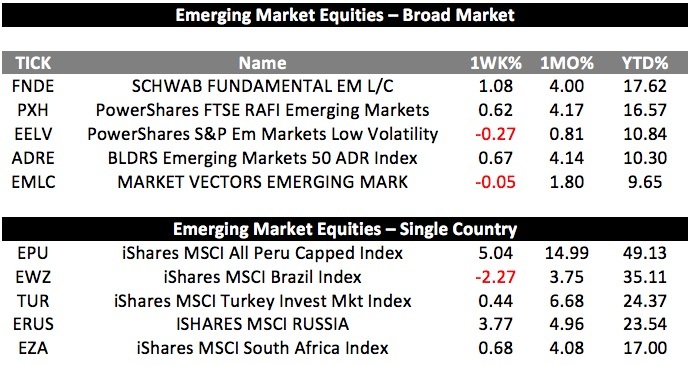 The table below shows some key ETFs in the emerging market space you can use if you want to get long in the sector. Right now, subscribers to my Successful ETF Investing newsletter continue to profit from ETFs pegged to the emerging markets. If you’d like to find out just how we’re doing this (at the lowest price we’ve ever offered), I urge you to try out Successful ETF Investing today. Click here to get started. Under the rules of medieval heraldry, gold and silver were classed together as “metallic” colors, but could not be used on top of one another in a coat of arms. That relationship between the two is similar in the world of finance today, where gold and silver are both classified as “precious metals,” but are really two different metals with two different tendencies. This week’s exchange-traded fund (ETF) spotlight on the iShares Silver Trust (SLV) will be a deviation from the various gold funds I’ve been featuring but it still will be within my current theme of examining promising precious metals ETFs. SLV was founded in 2006 and it is not your standard ETF. The trust is not an investment company registered under the Investment Company Act of 1940 nor is it a commodity pool under the Commodity Exchange Act. Shares of the trust are subject to the same requirements as a mutual fund. SLV’s purpose is, generally speaking, to reflect the price of silver owned by the trust at that time and give investors exposure to the day-to-day movement of the price of silver bullion. Like with several of the gold funds I have recently highlighted, rather than forcing shareholders to physically own a hunk of precious metal, SLV aims to give its investors easier, more cost-effective access to physical silver. That is because the expenses involved in an investment in physical silver are dispersed among all holders of iShares Silver Trust (SLV) rather than a single individual. One rather unique feature of SLV is that the Trust’s shares are not redeemable except in large aggregate units called “baskets.” These baskets are created when silver is deposited into the trust, and SLV then will sell silver to cover the redemption price of these baskets. Only authorized brokers who have entered into a contract with the sponsor and trustee of the trust can purchase or redeem baskets, but shares of SLV can be bought or sold through any brokerage account. SLV’s share price has traded in a wide arc over the last year, with its high and low points approximately matching the strong and weak times in the market. Year to date, SLV has risen close to 20% on the recent surge that has taken hold of precious metals and related sectors. The trust does not offer a dividend, but it has a modest expense ratio of 0.5% and about $5 billion in assets. 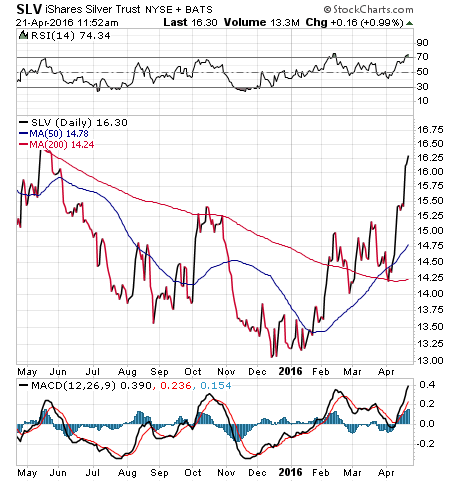 SLV is one of the largest precious metals ETFs out there. View the current price, volume, performance and top 10 holdings of SLV at ETFU.com. SLV is 100% invested in silver, similar to many ETFs that are aligned with precious metals. However, it lacks the diversified holdings of traditional exchange-traded funds. Usually, gold and gold stocks receive mainstream attention in the precious metals sector, but silver is an alternative investment. If you want to consider an investment in this “secondary” precious metal, then the iShares Silver Trust ETF (SLV) might be a good place to start. If you’d like to see my full ETF portfolio (as of April 20, 2016, all 17 ETF positions were in positive territory), I’m offering a limited-time opportunity to join Successful ETF Investing at an unbeatable price. Follow this link to learn more. The death of musician Prince was headline news around the globe yesterday, and for good reason. The pop icon was one of the most successful musicians ever, and he built that success largely by doing things unique and unexpected, both musically and professionally. In the above quote, Prince reminds us it’s sometimes better to provide what people need, and not just what they think they want to hear. This not only is true artistically, but also when it comes to money and investing advice. 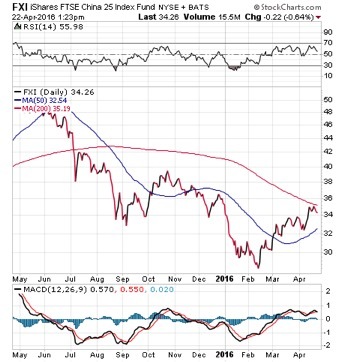 In case you missed it, I encourage you to read my column from last week about the technical potential in emerging markets ETFs. I also invite you to comment about my column in the space provided below. Economist Dr. Mark Skousen examines and interprets the latest gross output statistic release.